Vacation rules. All days should be vacation days! VACATION FOR EVERYONE! Ok, so since being off for a few days I've been a blob for the most part (and doing lots of blog brainstorming) but I just can't stand to sit around in pajamas all day. I feel weird and sleepy unless I shower and dress for the day. Its like a magical kickstart for my brain. At the same time, I don't want to be as done up as I am for work so the perfect solution is a tee shirt dress and oversized sweater. Add some high heel boots if I feel the need to leave the house. Bringing me to my next point, recently I read a short but sweet blog post on dressing for work and I have to say after almost 4 years of blogging I feel like breathing a sigh of relief for someone else saying what I've thought forever. Sure, sometimes for work I love to look polished in a killer outfit I've put together. Other days, more often than not, I just want to wear an outfit like my vacation outfit. I'm running around all day doing a million things with my focus being pulled in all different directions. Usually I've swapped lipstick for chapstick 40 minutes into the morning and by my 5th cup of tea for the day (this is at noon if you don't know my habits) my shoes are off and my feet tucked under my bum in my chair. Some days I wish I could wear all the layered-glittery-high-heeled outfits I dream of in my head or see in the blogosphere but that just isn't my reality. 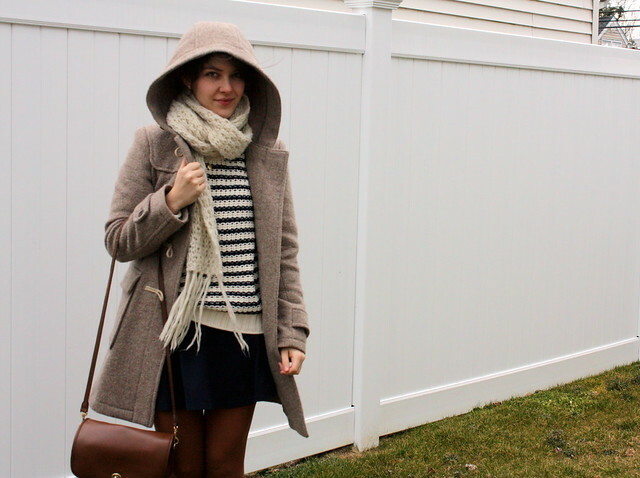 Since starting this blog I've striven to represent what I actually wear to my job. Maybe you've noticed my "what I wore to work" tags and if its there, that outfit got dragged in to work that day. Sometimes I see people in NYC streetstyle shots or in these phenomenal outfit pictures and I think, "There is no way they could wear that to work in all day," followed very shortly by, "And if they did, why can't they share their secrets to making awesome outfits more comfortable." But for now, here is what I wore for a day off! Word. Preaching to the choir. Kallie this is the perfect outfit for a day off! I feel the same way about work. Right now, I am wearing a giant thrifted sweater and high waisted jeans. I am all ready on Monday to look cute for the week, but it is hard to be motivated to look cute when you have all this work in front of you. Agreed. Some days I'm Ms Professional at work and other days (like today) I'm wearing my comfiest skirt, cardigan and loafers. Love this outfit though. Brown & black are my favorite combo and that sweater looks glooooorious. Great outfit, I love the shoes...they're super cute and look awesome in combination with all the earthy tones in this outfit. indeed. if i didn't take my outfit photos on my way to work i probably would wear the same five sweaterdresses and moccasins every day to the office. sitting for eight hours in an uncomfortable chair, surrounded by gray walls, does not inspire sartorial experimentation. it definitely seems like nobody in the blogosphere has a 'real job'--that may be because so many bloggers are under the age of 25, but it's nice to know there are others out there who have to work and pay bills and buy thrifted clothes because... they're cheap. I LOVE that jacket so damn much. Girl after my own heart definitely. I occasionally make an effort for work and even wore heels last week but by lunch time I just thought why is it taking me longer to walk everywhere and the next day reverted to nice and easy flats. My work place has no real dress code so I go casual most of the time, it's just so much easier! the tights are such a cute color! This is a gorgeous outfit! So cosy but very stylish...I love it! You look so cute and comfy in this outfit! I'm loving the brown booties. The way all the neutral colors work together in this is fantastic. A lot of the outfits I post to my blog wind up being work outfits, just because I go to work 5 days a week. I can't imagine having to pick something to wear, and then find some other more blog-worthy outfit to actually photograph and post. I think you can totally look polished and still feel comfortable though, it's all up to what you're wearing in the end. I love the color of your tights! And your shoes are super cute!